Corn tortillas are a staple in my kitchen, which is especially common if you are on a gluten free diet. I've probably tried my fair share of different ways to use corn tortillas - tacos, enchiladas, lasagnas, chips, etc - but one thing I haven't done was make taquitos, until now. 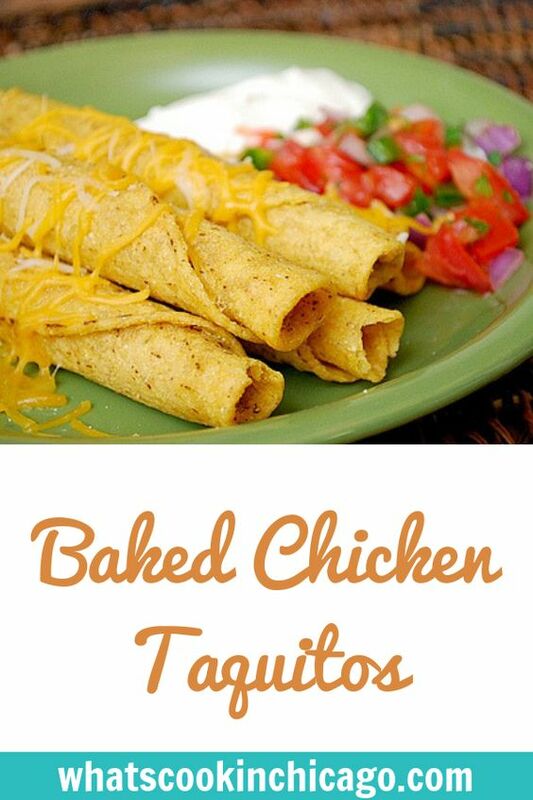 I recall a wildly popular recipe for Creamy Baked Chicken Taquitos, but settled to make this recipe from Whole Foods Market. I've been drawn to quite a few recipes on their site lately and have enjoyed ones I've made in the past. This one didn't disappoint either. I always thought making taquitos were similar to tacos, only rolling them up like thin cigars. Apparently the key thing is to dip the corn tortillas in warm chicken broth so that they are much more pliable. Once dipped, they're filled with a flavorful chicken filling topped with cheese. After rolling, these tasty cigars are baked up instead of fried. These are great to make ahead as well. To make ahead, prepare as directed and instead of baking after they've been rolled, place them on a baking sheet in a single layer and freeze until frozen before transferring to a freezer bag. When you're ready to serve them, preheat the oven to 425 and bake them from frozen on a baking sheet in a single layer for 20-25 minutes. Preheat oven to 425F and oil a baking sheet. In a skillet over medium heat, add the oil. When hot, add the onion and garlic, cooking until translucent. Add the cumin, paprika and salt, stirring to combine and cook 2 to 3 minutes longer, until fragrant. Remove from heat and stir in cilantro and chicken. Set aside. Bring chicken broth to a simmer in a skillet or pot wide enough to hold tortillas. When broth comes to a simmer, remove from heat and carefully dip tortillas briefly, one at a time, just to soften, about 1 to 2 seconds. Lay the dipped tortilla on a work surface and spread 2 or 3 tablespoons chicken mixture over bottom third. Top with a tablespoon of cheese and roll up. Place seam side down on the prepared baking sheet. Repeat with remaining tortillas. Spray or brush tortillas lightly with oil and bake until crisp and lightly browned, 12 to 15 minutes. Serve with sour cream, salsa and/or guacamole and garnish with more cheese before serving. I love taquitos! These look yummy! 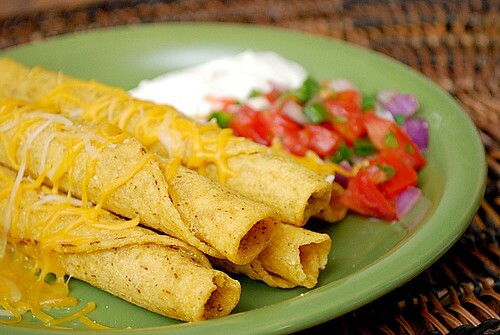 Your taquitos look killer! I need to make some again soon...your version this time! These look great-I love that they can be used as a freezer meal as well! I'm always looking for ideas of make ahead meals. These were fantastic , but they needed about twenty minutes.